This section describes how to use Melodyne in Cakewalk. For tutorials and detailed information about using all the features in Melodyne, please see the documentation that is included with Melodyne (in Melodyne, select Help > Manual, or visit http://helpcenter.celemony.com). Select an audio region or clip you wish to process with Melodyne. To select a region on the timeline, use the Smart tool or Select tool and drag across the bottom part of the clip(s). To select an entire clip, simply click the clip. For details, see Selecting clips. In the Track view, click the Region FX menu, point to Melodyne, then select Create Region FX. The selected audio region is converted to a Melodyne Region FX clip, and the Melodyne editor appears in the MultiDock view. Figure 431. Select the audio clip or region you want to edit in Melodyne. Figure 432. The Melodyne editor opens in the MultiDock view. Note: Although you can insert an ARA-compatible plug-in in a clip FX Rack, doing so will not provide all the ARA benefits of using the plug-in as a Region FX. Double-click the Region FX clip. Right-click the Region FX clip, and select Region FX > Melodyne > Open Editor. The Region FX plug-in interface appears in the MultiDock view. Melodic. Use for monophonic melodic material (only one note is ever sounding at any given instant). For best results, use a dry audio source without reverb. Percussive. Use with rhythmic, atmospheric and noise-based material, or any other material in which Melodyne cannot detect any clear pitch in the sounds. Polyphonic (Melodyne editor only). Use with single-instrument polyphonic material. In Melodyne assistant and essential, polyphonic material is assigned to the Percussive algorithm. Note: Polyphonic editing is only available in Melodyne editor with the patented DNA Direct Note Access technology. In Melodyne assistant and essential, the algorithm for polyphonic material is present but disabled in the Algorithm menu. This is because you can still open and play back projects that were created with Melodyne editor and contain polyphonic material, and in such cases, Melodyne automatically selects the polyphonic algorithm. However, Melodyne assistant and Melodyne essential do not allow you to edit polyphonic material, or select the polyphonic algorithm manually. Main tool. 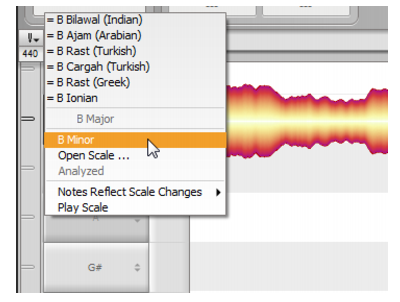 Use the Main tool to fine-tune individual notes. For details, see To modify pitch and timing with the Main tool. Macros. Use macros to automatically edit the selected notes. For details, see To correct pitch automatically by macro and To correct timing automatically by macro. You can even combine the two methods. For example, use the macros to quickly correct most pitch or timing problems, then fine-tune individual notes with the Main tool . Melodyne's Main tool is similar to Cakewalk's Smart tool in that it is context-sensitive and has different functions depending upon its position relative to a note. Similar to a clip in Cakewalk, each note (or “blob”) in Melodyne has several hotspots that you can click to modify the blob. To display these hotspots, select View > Show Blob Info in Melodyne. Melodyne now displays thin lines to identify the various hotspots when you point to a blob. Each blob has a front, center, back, and upper hotspot. The mouse pointer indicates the function of each hotspot. Figure 433. Main tool hotspots on Melodyne blobs. Double-click to create a note separation (double-click a note separation to remove it). Drag left/right to adjust the note length (the beginning of the note moves while the end remains anchored; any adjacent note is also stretched/compressed by the same amount). Tip: To make two adjacent notes completely independent, cut one of the notes, then paste it right back again. Ignore snap grid while dragging. Drag up/down to alter pitch. Drag left/right to move backward or forward in time. Drag left/right to adjust the note length (the end of the note moves while the beginning remains anchored; any adjacent note is also stretched/compressed by the same amount). You can also adjust the selected blob(s) with the following keyboard shortcuts. Select the region or clip you want to edit. Convert the selection to a Melodyne Region FX clip. For details, see To create a Melodyne Region FX clip. In Melodyne, select the notes you wish to edit. If no notes are selected, all notes will be edited. Click the Correct Pitch button to open the macro controls. Adjust the Correct Pitch Center slider to apply a degree of correction ranging from 0% (no correction) and 100% to the pitch center of the selected note(s). Note: By default, notes are moved towards the nearest semitone. To snap to the detected scale, select the Snap to <name of scale> check box. When enabled, any notes outside of the scale are ignored. 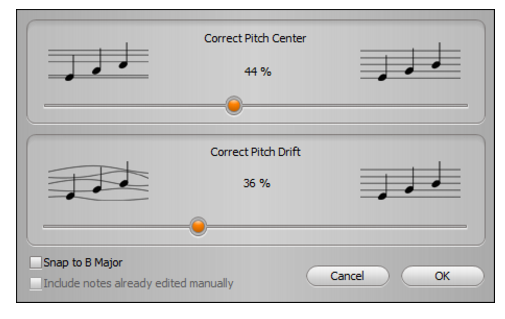 Adjust the Correct Pitch Drift slider to progressively reduce the amount of pitch drift exhibited by the selected note(s). Note: When adjusting notes with the macro controls, Melodyne will ignore any notes you have manually edited with the Main tool . If you also wish to edit these notes, select the Include notes already edited manually check box. Click OK when you are satisfied with the results. After using the Correct Pitch macro, you can fine-tune notes further with the Main tool , if desired. For details about using the Melodyne editor, consult the Melodyne Help menu. On Melodyne’s View menu, select Show Intended Notes. The Melodyne editing area now shows the actual starting position of each note, along with a gray frame that indicates the intended starting position. Click the Quantize Time button to open the macro controls. Under Select Groove Reference, select the note duration that will govern the time correction. Adjust the Intensity slider to apply a degree of correction ranging from 0% (no correction) and 100% to end up precisely on the beat. After using the Quantize Time macro, you can fine-tune notes further with the Main tool , if desired. 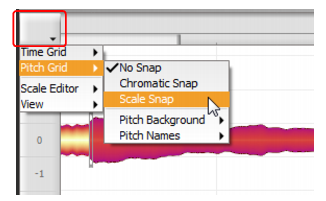 Melodyne can change the pitch of notes either continuously, or force the notes to snap to any scale. To specify how notes should snap, click the small arrow button above the pitch ruler and select the desired snap options on the pop-up menu. Click the small arrow button above the pitch ruler and select Selection and Master Tuning on the pop-up menu. Two new columns appear in the pitch ruler. The first (narrow) column lets you adjust the master tuning, and the second (wide) column shows the scale ruler. In the (wide) scale ruler, click the note you want to assign as the tonic (root note of the scale). From the context menu that appears, confirm the tonic and scale you want to use for the pitch grid. Select the Melodyne Region FX clip, then select Region FX > Melodyne > Follow Host Tempo on the Track view menu. Right-click the Melodyne Region FX clip and select Region FX > Melodyne > Follow Host Tempo on the pop-up menu. The Melodyne Region FX clip will now obey any tempo changes in the project. Note: You cannot slip-stretch a Melodyne Region FX clip when the Follow Host Tempo option is enabled. Melodyne features accurate tempo detection, and Cakewalk’s ARA integration allows you to easily synchronize a project’s tempo map to the tempo of any Melodyne Region FX clip or regular audio clip. When an audio clip is converted to a Melodyne Region FX clip, Melodyne detects any inconsistencies between the detected tempo and the project tempo. If any inconsistencies are detected, Melodyne’s Tempo Options button will pulse. Figure 434. The Melodyne Tempo Options button pulses if there are any tempo inconsistencies. Drag the Melodyne Region FX clip to Cakewalk’s Time Ruler. Note: In addition to dragging a Melodyne Region FX clip to the Time Ruler, you can also drag any audio clip to the Time Ruler and Cakewalk will extract the tempo information using Melodyne and ARA and set the global tempo map for that region. It is not necessary to first convert the audio clip to a Melodyne Region FX clip, but this approach will not allow you to edit the tempo in Melodyne before extracting the tempo. The only exclusions are Groove clips and REX files, since they already follow Cakewalk’s tempo. If a clip has Lock Position enabled, hold down the CTRL key in order to drag it to the Time Ruler. Click the Tempo Options button in Melodyne, then select Use the tempo grid detected by Melodyne. The clip’s tempo map is added to Cakewalk’s tempo map. Copy an audio clip to a new track or Take Lane. Convert the copied clip to a Melodyne Region FX clip. For details, see To create a Melodyne Region FX clip. 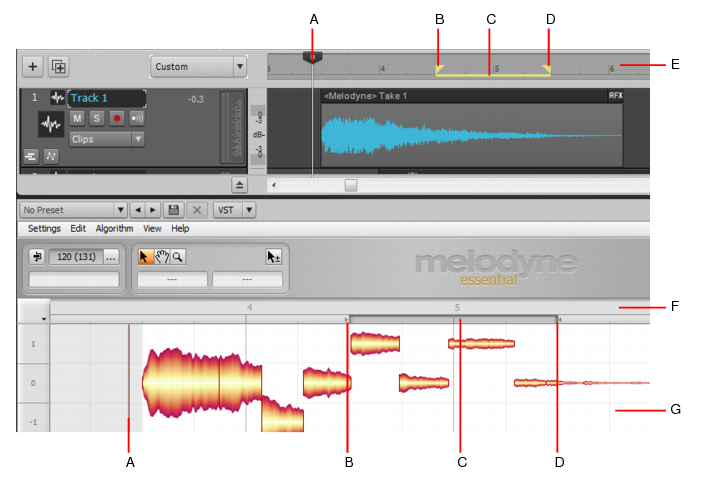 Use Melodyne’s pitch features to transpose the audio data. Simply drag the Melodyne Region FX clip to a MIDI or instrument track. Select the Melodyne Region FX clip, then select Region FX > Melodyne > Copy MIDI Events on the Track view menu. You can then paste the data to a MIDI or instrument track. 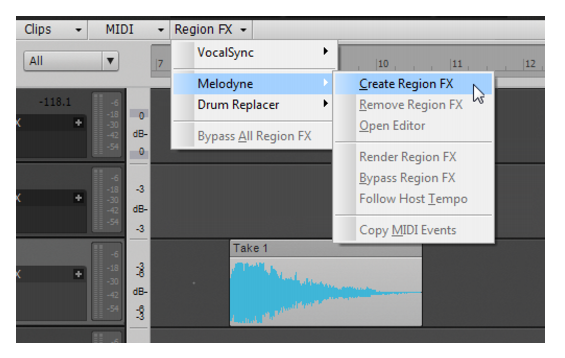 Right-click the Melodyne Region FX clip and select Region FX > Melodyne > Copy MIDI Events on the pop-up menu. You can then paste the data to a MIDI or instrument track. Drag an audio file from the Browser and drop it on a MIDI or Instrument track. Drag an audio clip to a MIDI or Instrument track. If you change your mind while converting a long audio file, press the ESC key to cancel the operation. Replace or double an audio track with a MIDI or software instrument. Transcribe and analyze musical structure of audio data. You can even view the data as musical notation in the Staff view. Extract the groove of an audio track and create a Groove Quantize template that can be applied to MIDI tracks. Extract the beat information from an audio track and use the MIDI notes as a guide track for creating a tempo map in Cakewalk (Process > Fit Improvisation). Use vocal or other audio source as a MIDI input device (sing/hum a melody, etc., and convert to MIDI). Figure 435. Drag a Melodyne Region FX clip to a MIDI or Instrument track to convert it to a MIDI clip. Note: Melodyne essential and Melodyne assistant only support monophonic audio data. If the audio source contains polyphonic material, the resulting MIDI conversion will be monophonic. Polyphonic audio-to-MIDI conversion is only supported in Melodyne editor. Tip: For the best results when converting audio to MIDI, first convert the audio to a Melodyne Region FX, then use the Melodyne interface to precisely identify the desired notes/beats. You can then drag the Melodyne Region FX clip to a MIDI or Instrument track and get predictable results. Click in the top part of the Melodyne Time Ruler. Cakewalk’s time follows along. Double-click any empty area in Melodyne. Double-click in the upper half of the time-ruler in Melodyne. To create a loop region, drag in the lower part of the Melodyne Time Ruler. To adjust the loop region, drag the loop handles in the Time Ruler. To move the entire loop region, drag the middle of existing loop region in the Time Ruler. Tip: To ignore the snap grid while adjusting the loop region, hold down the ALT key while dragging. 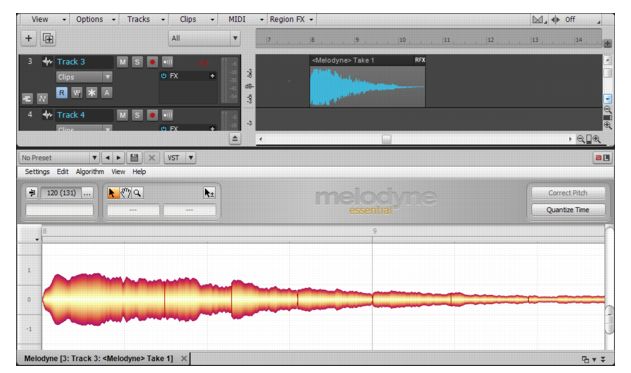 Double-click the lower part of the Melodyne Time Ruler. Figure 436. You can adjust loop regions and playback in either Cakewalk or Melodyne.